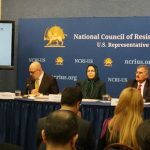 On Monday, February 11th, the United States Representative Office of the National Council of Resistance of Iran (NCRI-US) held a panel discussion on the Iranian regime’s forty-year record of domestic human rights violations and foreign terrorist activities. The event was held at the National Press Club in Washington, D.C. 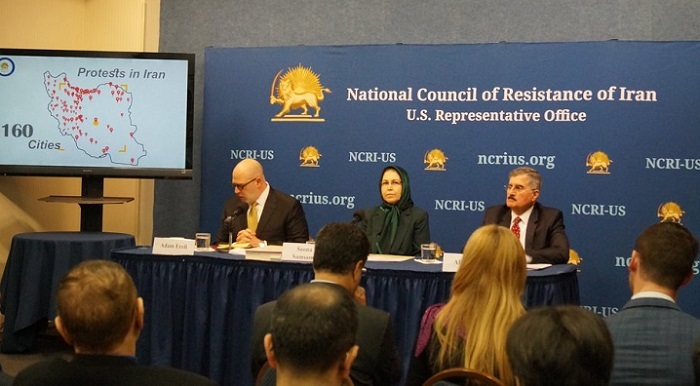 The panel, which was led by Soona Samsami, the NCRI representative in the United States, included a discussion of the current unrest and economic crisis in Iran and the current impact of the massive popular uprising that took place one year ago, the resumption of U.S. sanctions, and the start of a firm policy toward the regime. The panel also discussed Iran’s future and possible policies toward Iran that could be adopted this year. The panel coincided with the 40th anniversary of the overthrow of the Shah. On February 11, 1979, the people of Iran rose up and took down the Shah’s monarchy. The MEK played a key role at the end of this dictatorship and hoped to establish a free Iran. However, Ruhollah Khomeini and a group of hard-line clerics seized control of the country and created the theocratic regime that exists in Iran today. Over the past forty years, the mullahs’ regime has been responsible for a number of conflicts in the region and has oppressed its own people. The MEK defended the liberties obtained after the 1979 revolution and showed extraordinary discipline to prevent an early confrontation with the new dictatorship, despite many of its followers and supporters were beaten, arrested, tortured and murdered by regime’s club wielders and the IRGC (Islamic Revolutionary Guard Corps) forces. “Tehran’s reaction to its organized opposition is a clear indication that there is a viable alternative to the regime in the form of the National Council of Resistance of Iran.